MudHen Brewing Company is turning ONE! You are invited to join us for a day of celebration at our 1st Anniversary Birthday Party, starting at 11 am on Saturday, April 13 at MudHen Brewing Co., located at 127 W. Rio Grande Avenue in Wildwood. It seemed like forever until the opening of MudHen Brewing Co. - now, a year later, so much has happened! Jump aboard this train and enjoy the journey with us! ... and more spectacle, MudHen style! Come One, Come All, Bring Your Family, Bring Your Friends! We are proud to be part of the Wildwoods, NJ community! 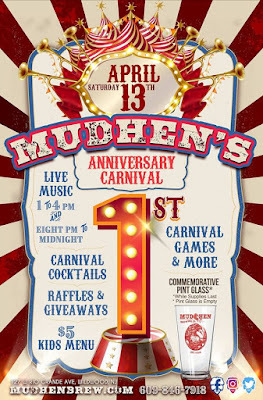 For the complete schedule of MudHen Brewing Co. events and additional information, find us online at www.MudHenBrew.com. Also LIKE us on Facebook at MudHenBrew.